Zero-K is a Real Time Strategy game set near the end of the universe. Manipulate the terrain, set things on fire, fight epic battles over land, air and sea. Conquer the galaxy, solo or co-op, in over 70 campaign missions. Hop online for tense 1v1 or massive battles with up to 32 players. Very Positive (29) - 89% of the 29 user reviews in the last 30 days are positive. Very Positive (958) - 90% of the 958 user reviews for this game are positive. In celebration of Zero-K's first anniversary on Steam, our (sometimes) tournament maestro _Shaman is organising a 2v2 tournament at 14:00 UTC on 27 April 2019! This version contains a few important fixes, compatibility for an upcoming engine update, and a reduction of the previous Outlaw buff. Outlaw damage 35 -> 30 (was 20 previously) with the corresponding change to slow damage (105 -> 90). Paladin manual fire now fires 12 missiles (increased from 10) to match its model. Raven thinks units are thinner than they are, causing it to dive lower and hit more consistently. Welder defaults to hold position. Fixed units failing to reveal themselves if they fire from behind terrain while inside an enemy units LOS range. This primarily makes buried defenses targetable. Fixed units with attack orders not having their attack order overridden by some commands. This mostly affected issuing reclaim orders to fighting Welders. Fixed a case of tactical AI not working for units on hold position. Blocked the ability to give gunships orders off the edge of the map. Zenith now gains XP and can shoot through allied shields. Fixed issue where the autofocus would incorrectly weaken when zooming in after a certain point. Fixed colours blending to a mush (unfortunately this means some banding in dark regions, not sure how to fix without ruining the more pronounced circles). Normalized depth calculations to Spring unit distances, so blur power is no longer map-dependent. Fixed projectile lights rendering on top of DoF (this involved changing priority, and this seems like a blunter fix than necessary). Expanded blur radius limits so near-to-camera objects blend more nicely. Made the transition from in-focus to out-of-focus a bit smoother. Commander wanted! Construct giant robots, build an army of a thousand Fleas. Move mountains if needed. Bury the enemy at all cost! 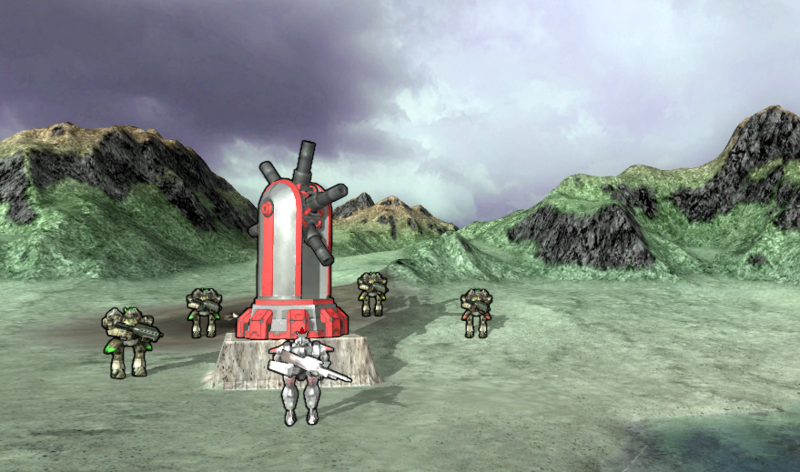 Traditional real time strategy with physically simulated units and projectiles. 100+ varied units with abilities including terrain manipulation, cloaking and jumpjets. 70+ mission galaxy-spanning campaign to be enjoyed solo or co-op with friends. Challenging, (non-cheating) skirmish AI and survival mode. Multiplayer 1v1 - 16v16, FFA, coop. ladders, replays, spectators and tournaments. PlanetWars - A multiplayer online campaign planned to start in May. Really free, no paid advantages, no unfair multiplayer. Simulated unit and projectile physics is used to a level rarely found in a strategy game. Use small nimble units to dodge slow moving projectiles. Hide behind hills that block weapon fire, line of sight and radar. Toss units across the map with gravity guns. Transport a battleship to a hilltop - for greater views and gun range. The terrain itself is an ever-changing part of the battlefield. Wreck the battlefield with craters that bog down enemy tanks. Dig canals to bring your navy inland for a submarine-in-a-desert strike. Build ramps, bridges, entire fortress if you wish. Burn your portrait into continental crust using the planetary energy chisel. Enjoy many hours of single player and coop fun with our campaign, wide selection of non-cheating AIs and a survival mode against an alien horde. Explore the galaxy and discover technologies in our singleplayer campaign. Face a challenging AI that is neither brain-dead nor a clairvoyant cheater. Have some coop fun with friends, surviving waves of chicken-monsters. Cloaking? Resurrection? Tough choices customizing your commander. Zero-K was built for multiplayer from the start, this is where you can end up being hooked for a decade. Enjoying epic scale combat? Join our 16v16 team battles! Looking for a common goal? Fight AIs or waves of chicken-monsters. Prefer dancing on a razor's edge? Play 1v1 in ladder and tournaments. Comebacks, betrayals, emotions always running high in FFA. Want to fight for a bigger cause? Form a clan and join PlanetWars, competitive online campaign with web-game strategic elements, diplomacy and backstabbing. We are RTS players at heart, we work for nobody. We gave ourselves the tools we always wanted to have in a game. Do what you want. No limits to camera, queue or level of control. Paint a shape, any shape, and units will move to assume your formation. Construction priorities let your builders work more efficiently. Don't want to be tied down managing every unit movement? Order units to smartly kite, strafe or zig zag bullets. Zero-K is a long term project and it shows, millions hours of proper multiplayer testing and dozens of people contributing ever expanding content. Learn to use all of our 100+ units and play on hundreds of maps. Invent the next mad team-tactics to shock enemies and make allies laugh. Combine cloaking, teleports, shields, jumpjets, EMP, napalm, gravity guns, black hole launchers, mind control and self-replication. Tiny flea swarm that clings to walls? Buoys that hide under water to ambush ships? Mechs that spew fire and enjoy being tossed from air transports? Jumping Jugglenaut with dual wielding gravity guns?